1. How can ReaMark help me? ReaMark specializes in printing and direct mailing of postcards and other marketing materials for Real Estate and Mortgage professionals to market their services to homebuyers and sellers. Our state-of-the-art 55,000 square foot printing and mailing facility allows us to produce the highest quality postcards with fast turnaround time. Since we manufacture our own postcards, we are able to keep our prices low in order to pass the savings to our customers. In addition, our postcard mailing services provide agents with a "worry-free" marketing program. All you have to do is order your cards and provide us with your mailing list. We'll take care of all your printing and mailing so you'll have time to concentrate on other important things. 2. How can I shop ReaMark? Shop via our catalog: Call 1-800-932-2957 and request our FREE 92 page full-color catalog featuring over 650 beautiful postcards with different marketing themes, such as recipes, humor, prospecting, etc..
Shop on-line at www.ReaMark.com: Browse our on-line catalog to view any postcards then follow the on-screen easy steps to create and view your cards. 3. What is the minimum that I can order? Our minimum order is 300 total postcards (in increments of 100 cards). This means you may order 300 postcards in one card design or 100 postcards in three different card designs. Need a custom postcard? Minimum order quantity is only 300 per style. Order as few as 300 newsletters total (min. 300 per issue, must be ordered in increments of 50). Maximize your savings with quantity discounts*, e.g. order 500 of 4 issues to receive the 2,000 quantity price break. 4. What does the backside personalization include? The backside personalization includes: your photo, company logo, address, phone numbers, email and web address, association logos, etc. It also includes the message for the card. You may use our suggested message, leave it blank or create your own custom message. We can also include your mailing permit stamp if you wish. The backside will be printed in Full Color or Black and White. 5. May I customize the Layout or the Message for the back of the cards? We normally use our layout design for the back of the cards. However, if you have a layout that you like, let us know and we can customize it - (within postal regulations). If you want to have your own personal message instead of our suggested message, you have up to 55 words. You may customize any layout with any image from our catalog, website or send us one of your own! We also do full custom printing. Call 1-800-932-2957 for a quote. Via Phone: Call us toll-free 1-800-932-2957 Mon. - Fri. 6am to 4pm, PST. to place your order. Via Fax: Complete and Fax your order form to1-800-805-8173. 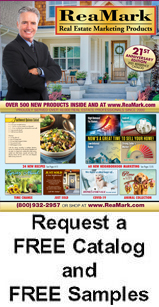 Via the Internet: Log on to our web site: www.ReaMark.com and browse our on-line catalog. You may order your cards and preview the backside of the cards. (Please see question #10 for photo and logo requirements.) Faxed copy of logo is not acceptable due to lack of clarity. 7. What is the turnaround time after I place my order? Once we receive your photo and logo, we will fax you a layout proof within 1-2 business days, 1-3 business days for newsletters and custom layouts. We provide 2 free proofs. An additional charge will apply for excessive layout changes beyond our standard free proofs. Upon our receipt of your layout approval, we will produce and ship most orders within 3 business days, 5 business days for newsletters. Please allow 2-5 business days for UPS Ground delivery. If you need your order sooner, please ask us for other express delivery options. 8. When do I get charged? Upon our receipt of your layout approval, your order will be submitted into the print production process. All orders must be paid in full by check or credit card at this time. 9. How does a Group Order work? Group orders receive the combined quantity discount for all the agents in the group at the time the order is placed. For example, if three agents in the group order 5,000 cards each, each of you receive the 15,000 card price instead of the 5,000 card price. Each order within the group order is treated as an individual order so that each agent may select his/her own cards and personalization. Each agent is responsible for individual shipping charges based on his/her order total. Each agent will receive an individual layout proof. Order production will start when we receive the agent's signed layout approval. Orders do not need to wait for other agents approvals in the group. a. Each agent completes his/her own order form - Click here to print a copy of the order form..
b. Add up all card quantities from all agents orders. Use the total quantity to find the individual card price on the pricing chart. c. Each agent calculates shipping charges based on order total. Click here for Shipping Chart..
d. Each agent adds applicable fees: CA sales tax, etc. e. Include a sharp-focused photo, a business card, company logo or letterhead (we may already have yours, please ask). 10. What are the requirements for sending photos and logos? Photos: We prefer your original photo or logo in Color or black and white (2x2 to 5x7). Sharp-focused photos produce the best results. Email us your photo, please save it in .tiff or .jpg format. If possible, please save it with a resolution of 300 dpi or higher to produce a sharp picture. Picture file size between 300 KB to 1 MB should be useable. 11. Can ReaMark do my mailing? Yes! Click here for Mailing Services. We require that each mail drop be at least 300 pieces. If you plan to mail multiple months, we can set up your order to give you the best pricing for the highest savings. For example, if you plan to mail 300 postcards every month for six months, we would give you the 1,800 cards quantity price. (Note: pricing for the postage portion is based on each individual mail drop). a. Client provided List: Your client list needs to be in Excel or other database format (such as .csv). If a list is already setup to print labels in Word - we will need to manually enter the names to create a database for you. (see item "b" below). Email your mailing list to: mail@reamark.com. b. Manual List Entry: 24¢ per address - If you don't have your client list available in a database format, we can enter the names manually. c. List Changes: 12¢ per address (minimum $10.00) - This is if you need to add or delete a name from your list. d. Need a mailing list? We do not provide lists at this time. You may contact your local Title Company to request a mailing list based on your specification. MAILING COST PORTION: (This includes Postage and Processing): To make sure your mailing piece receives the highest delivery result, we perform address validity/certification, duplicate removal, national change of address (NCOA), presort, barcode, inkjet address, and deliver to post office) - Price does not include the cost of the product.